I know I'm obsessed. Sue me. I enjoyed Scoop. I don't get the hateful critical reaction. One of the main complaints seems to be that it's a light and inferior rehash of Manhattan Murder Mystery, and since I haven't seen that, I can't really speak to that point... but Scoop works well enough on its own terms. In starts off a bit shaky, but makes up for it by the end. Once one is able to get over the impossibility of the initial supernatural happenings necessary to set the scene, the movie's charm takes hold. Contrary to popular belief, Woody does not in fact play Scarlett's father in Scoop; he actually plays a man playing Scarlett's father, and hence Scarlett's not actually "doing Woody" per se (though it's nice to see her have a go at broad comedy). Scarlett's character, Sondra Pransky, meets Woody's character, Sid Waterman, a magician, when he selects her out of the audience to be part of his magic act. While in his box ostensibly "disappearing", she meets the ghost of a famous reporter, who gives her the "scoop" (which he picked up beyond the grave) that rich socialite Peter Lyman (Hugh Jackman) is in fact the Tarot Card Killer, a serial killer on the loose. Once the show is done, Sondra enlists Sid to pretend to be her father to help her spy on Peter Lyman, and once they meet him at a club, she pretends to be an actress named Jade Spence, and begins falling in love with him. By the time Scarlett and Hugh got together, and Woody was allowed free reign to parade his hapless self around rich people for their amusement, the movie had won me over. It has its flaws, sure, and is hardly the second coming, but I laughed a lot, and was quietly amused much of the time I wasn't laughing, and when I was neither laughing nor quietly amused, I was just enjoying watching ScarJo and The Jackman (hey, there are far worse ways to spend one's time). This was clearly "Woody lite", but it was still better than, say, Melinda & Melinda, where just about every character seemed to be a transparent Woody surrogate. Here, at least, the characters and charms feel genuine, if a tad derivative. Verdict: Underrated. Worth your time." Wordplay is a totally different animal. I really have no idea why I'm writing these reviews together; I suppose it's because I saw the films back-to-back, and that was just a time constraint issue. Anyway. 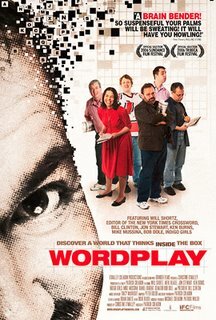 Wordplay is a documentary about crossword puzzles. "Why?" you may ask. "Why a documentary about crossword puzzles?" And I have no answer. What a random film to make. But what a fascinating film to watch. It basically divides itself into two parts. The first is a collection of profiles of notable crossword puzzle players, from random championship puzzlers to famous amateurs like Jon Stewart, Bill Clinton and the Indigo Girls (one segment focuses on the actual creator of the New York Times crossword puzzle, a professional puzzler with a degree in enigmatology). The second is the following of an actual crossword puzzle tournament, in which the aforementioned skilled puzzlers face off against one another in their ruthless fight for the championship. In this respect, Wordplay recalls Spellbound, an uber-fun doc from a few years ago about kids in the national spelling bee. Unfortunately, Wordplay is far less funny and charming, and its contestants are actually much nerdier. Still, there's palpable drama in the tournament, and it's fun to see such highly intelligent people compete in such a specialized, pointless venture. OK, that was harsh. The point of the venture, we learn, is the human need to "figure things out." Crossword puzzles are shown as a symbol of mankind's drive to solve problems with knowledge. The film is at its best, I think, when it focuses less on the drama of the tournament than on the idiosyncrasy of the puzzle-solving process, and the part it plays in people's lives. The New York Time crossword puzzle, I've learned, is not only the gold standard of crossword puzzles, but also part of the routine of millions of enthusiastic puzzlers. I used to be an avid puzzler (in the larger sense)... and while I'm not much of one anymore, I'm still happy to watch good films about puzzles and those who love them. Verdict: "A good film. Worth your time." oh, I love Manhattan Murder Mystery! It has young Zach Braff!